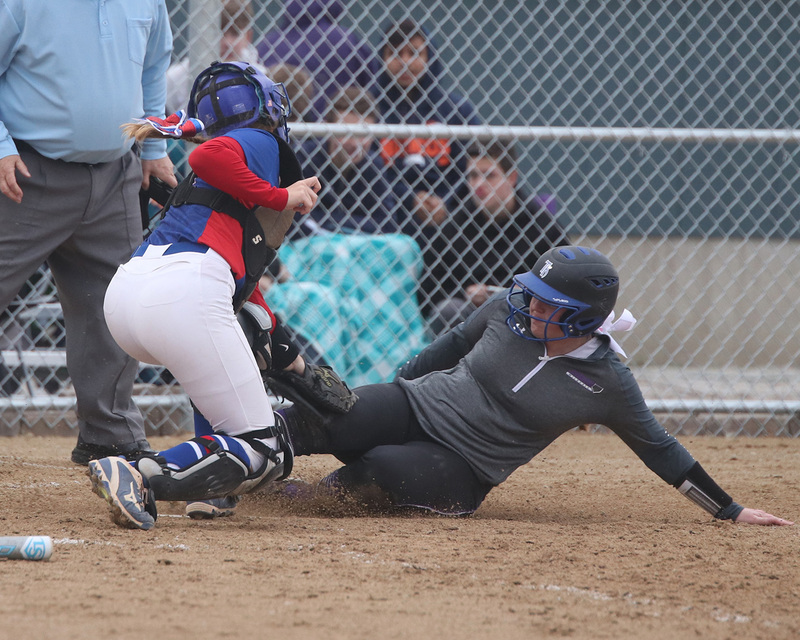 Louisburg senior Karson Griggs slides safely into home plate Thursday during the Lady Cats’ doubleheader against Wellsville at Lewis-Young Park. The Louisburg softball team had a lot of pent up frustration after losing its first six games to start the year. The Lady Cats (2-6) got things going early in the opener as they used a 7-run second inning to stake them to an early lead they wouldn’t give up. Senior Molly Rison provided the Lady Cats with a big hit in that second inning as she connected on a 2-run home run over the centerfield fence. Junior Reilly Ratliff-Becher also had a 2-run single in the inning and junior Kayla Willey added an RBI hit. 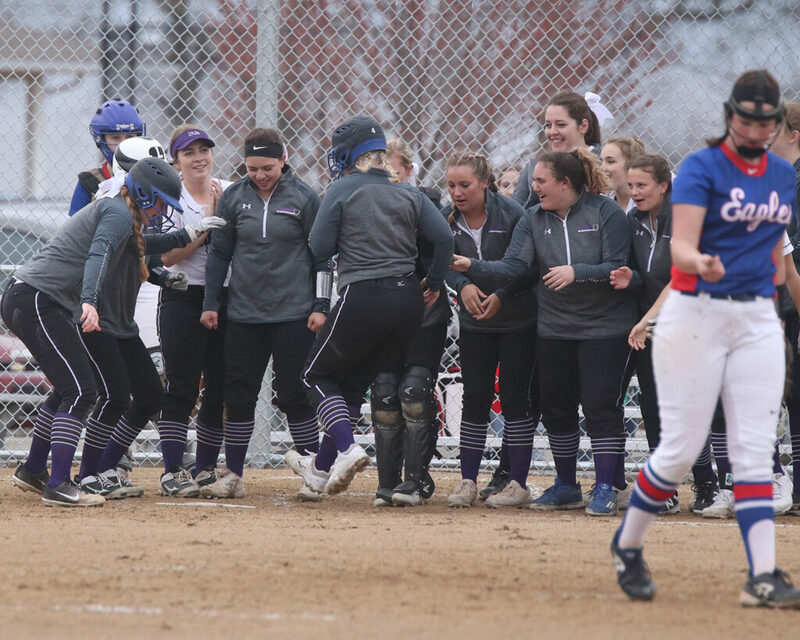 Members of the Louisburg softball wait on Molly Rison to step on home plate to celebrate her home run Thursday. Freshman pitcher Mia Wilson kept the Wellsville hitters in check most of the evening as she allowed one earned run on three hits to go along with four strikeouts in the complete game effort. Louisburg junior Reilly Ratliff-Becher makes contact with a pitch Thursday during the Lady Cats’ doubleheader. Louisburg will try and keep its winning ways going today when it hosts Bonner Springs for a doubleheader. First pitch is set for 4:30 p.m., at Lewis-Young Park. 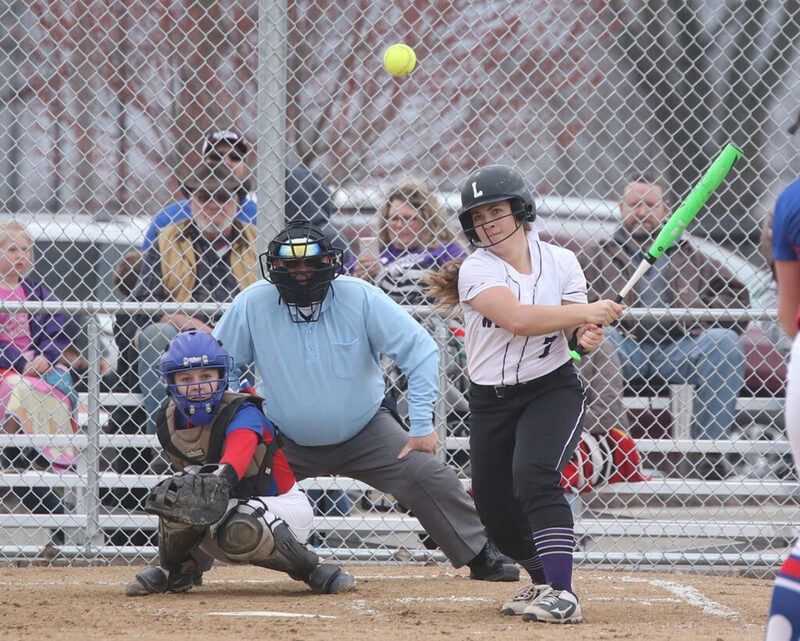 On April 2, the Louisburg softball team traveled to Spring Hill for a Frontier League doubleheader and the Lady Cats had hard time getting its offense going in a 7-0 and 11-1 loss.